I’ve used this diagram a few times in the past to start conversations about the move from hierarchical structures to more networky ones – including a couple of years ago, where Clay Shirky was talking about the changes that membership organisations need to make. Sending out newsletters and central event invites won’t pull in the subs when people can use social networks to organise for themselves. The organisations won’t survive. 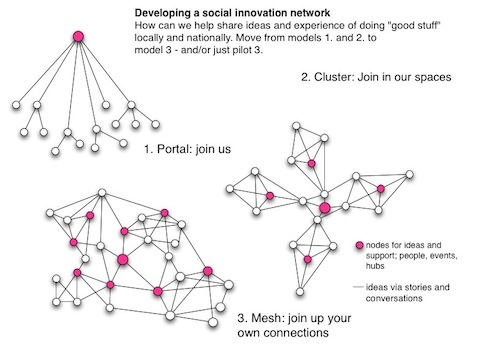 I’ve used the diagram more recently to talk to people about the sort of online and face-to-face sharing space for social innovation that People Powered Change might become in fulfilling the vision set out here by Linda Quinn for the Big Lottery Trust (BIG). Increasingly people use social networks for knowledge sharing, and in addition Geoff Mulgan argued recently that they are one good way to help embed reciprocity in our society. The idea of helping people share peer-to-peer, and not through a hub, chimes with the remarks reported here by John Popham from Toby Blume of Urban Forum, and Peter Wanless, of BIG. Both are chief executives in the new mould, using social media themselves and encouraging staff to do the same. While John was reporting Toby and Peter’s presentations, I was hearing at the Business of Collaboration seminar that organisational adoption of social media and networky behaviour won’t happen without that leadership. I also heard that the future will increasingly be mobile, with content delivered through apps, not conventional web sites. So – it is possible to argue, at least anecdotally, that becoming more networky is important for individual learning, social cohesion, and organisational survival. People Centred Change, and communications. At the moment a lot of organisations still work in model 1. Command and control structure, bureaucratic procedures, limited sharing outside the organisation, formal collaborations, restrictions on the use of social media. This still applies in some big organisations in the community and voluntary sector … and funding regimes don’t help. When you have to compete furiously with other organisations on the landscape for grants and contracts there’s pressure to keep things to yourselves. Your funders are probably hierarchical too… so everything chugs along as normal until the grants and contracts dry up and you find that the people you were serving are finding they can get along without you. Am I exaggerating? Not much, I think. All this applies in strength when looking at knowledge-sharing. It is very difficult to maintain traditional knowledge portals, with high editorial overheads, in a sector that doesn’t expect to pay for services, grants are increasingly scarce, and where advertising revenue is unlikely to be available. But how about model 2, where a number of organisations might collaborate to provide complementary services? That’s already on the horizon for People Powered Change, with initial partner investments made in Your Square Mile, Media Trust, Unltd, and Young Foundation. There are earlier posts on my personal blog. The challenge is going to be to expand from model 2 into model 3 – where people are making their own connections peer-to-peer as well as with some hubs. The joining-up in the peer-to-peer network comes partly from hubs, but also from sociable events designed for developing and sharing innovative ideas, like this and this, and also I believe by developing the practice of social reporting. We need network builders as well as networking people. While it is possible – in theory – to design the move towards model 3, in practice it is really difficult unless the people involved have some personal experience of networked communications and networky ways of doing things. It can seem like a foreign country – and the leadership of people like Toby Blume and Peter Wanless is important to give people confidence. The Transition Network, as I wrote here, is a terrific example of central support that helps to build local projects – not own them. The book, the Networked Non Profit, by Beth Kanter and Allison Fine, is an essential read. However, when learning to swim there’s no substitute for getting into the pool – and so as part of our work with BIG we are exploring how to pilot some peer-to-peer communication, probably using Google Plus. I’ll report later … well, actually, some of it will be open so you’ll be able to see how we get on. The best networking often involves food – so I wonder if Tessy and Laura would run a Pie Lab for the pioneers. The best ideas are often the simplest.